To say that we are big fans of pizza around here is pretty much an understatement. My husband worked with Italian food for over 15 years plus he opened a pizza restaurant here in Atlanta with his brothers. That's not to say that we don't enjoy a make it at home pizza night and in fact, we love to do this because the entire family looks at it like recipe development. What can we put on a pizza that will make everyone want it? We hope that you love these 15 Pizza Recipes as much as we love pizza. OXO Good Grips Stainless Steel Scraper & Chopper – this is a must and makes cutting those veggies a breeze. Kitchy Pizza Stainless Steel Cutter Wheel with Protective Blade Guard – this cutter is more ergonomic and perfect for kids to use. Dough-Joe Pizza Steel Baking Sheet–The Samurai – this has been on my wishlist because although I am partial to actual pizza stones, this thing just looks cool! Presto Pizzazz Plus Rotating Oven – ok I would have never considered this until I saw that there are over 2775 reviews on Amazon and the product has 4.5 out of 5 stars. Plus I love gadgets AND it's $50. the Spinach and Artichoke Dip Pizza sounds amazing. What a great list of pizzas. I have to say the one I want to try the most is the Chicken Bacon Alfredo Pizza. It sounds and looks so good. I’m very intrigued by the pasta pizza. 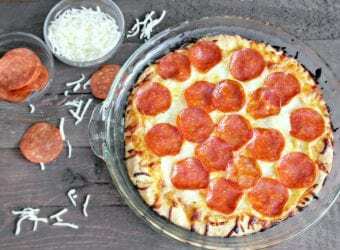 Excellent these variations of recipes of pizza, it is good not to always make the same ones, it gives to innovate and please the palate of all the guests. I like Grilled Barbecue Pizza . I will try it. Consultei algumas receitas e gostei do que vi, as receitas são sensacionais, vou fazer algumas receitas, sou simplesmente louca por pizzas de vários sabores. Adoro! Several of these sound pretty good. I’d like to give the Greek Pizza a try. These all look great but I really want to try the Chicken Bacon Alfredo Pizza!